Gas is becoming harder to find in Tampa Bay, the city on Florida's west coast that is bracing for impact from Hurricane Irma's winds and rains. About 58% of gas stations in the Tampa-St. Petersburg area were without fuel Sunday morning, according to estimates from the crowdsourcing platform GasBuddy. That's a 14 percentage point jump from a day earlier. The latest fuel outages were reported just as Irma made landfall in the Florida Keys as a Category 4 storm. The storm was initially expected to hit Miami directly. But Irma has shifted, and forecasts now show it moving up the west coast Sunday and Monday, hitting Naples and Fort Meyers before reaching Tampa. About 49% of gas stations in the Naples-Fort Meyers area were without gas Sunday morning, according to GasBuddy. That's an improvement over the 61% of outlets that did not have gas Saturday afternoon. Almost the entire state will feel the storm's impact. Most of Florida is covered by a hurricane warning that affect about 36 million people. And gas shortages are happening statewide. Nearly 64% of stations in the Miami-Fort Lauderdale area are out of fuel, according to GasBuddy. In the West Palm Beach-Fort Pierce region, that number is about 56%. Even in Tallahassee, which is about 200 miles northwest of Tampa, more than half of stations don't have gas. Some areas of Georgia, South Carolina and North Carolina are also at risk. GasBuddy says 30% of the stations in Jacksonville, Georgia are dry, as are 26% of stations in Savannah. The gas shortage problem has been made worse because of "panic buying" earlier in the week. Many Florida residents who were unsure of where the storm was headed raced to fill up their tanks. Another factor: Hurricane Harvey. 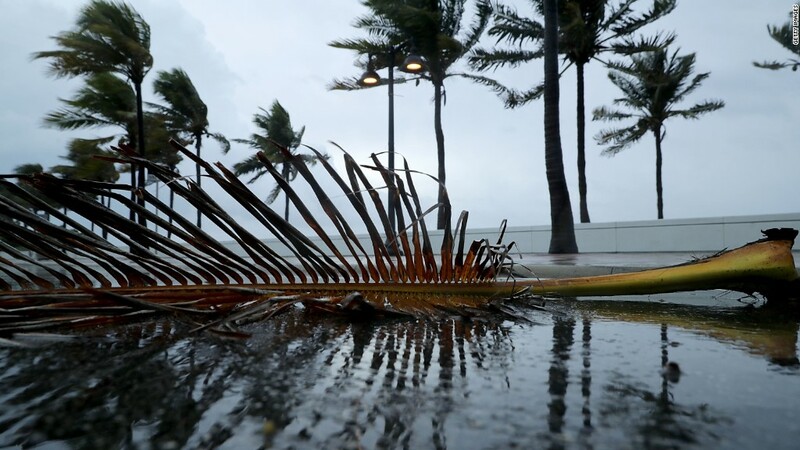 That storm disrupted fuel deliveries to Florida and other markets when it knocked out swaths of the Gulf Coast's oil refineries at the end of August. Florida Governor Rick Scott has tried to mitigate the shortage problem, according to a report by S&P Global Platts. Scott has encouraged gas stations to remain open as long as possible, and has offered up police escorts for fuel delivery trucks shipping gas to stations along evacuation routes. Even if Floridians find gas, it will probably cost more than they're used to paying. The average gallon of gas in Florida sold for $2.73 as of Sunday morning, according to AAA. That's up from $2.28 a month ago. -- CNNMoney's Jackie Wattles and Matt Egan contributed to this report.